It is interesting to compare the present degree of penetration of cellular automaton models into the field of biology (including ecology) with that of a much older mathematical approach, the differential equation. A search on biosis using each term as a key phrase turned up 3993 instances of the latter, as compared with 357 instances of the former. Presumably a tenfold majority of authors still feel more at home with differential equations. The two tools are markedly different. Differential equations describe continuous behavior, whereas cellular automata describe discrete behavior. Despite the differing conceptual frameworks, differential equations have been used in discrete situations (such as predator-prey relations) and, conversely, cellular automata have been applied in continuous situations (movement of swarms and flocks). How Good Are the Models? The essential question to be asked in the area of applications of cellular automata to ecology is: 'How useful are cellular automata in generating insight into biological and ecological processes'? Among the most persuasive images in Wolfram's A New Kind of Science are those of seashells decorated with patterns that are eerily similar to those produced by some of his elementary cellular automata. Figure 5 shows a fair rendition of a portion of one of these patterns as though it were produced by such a cellular automaton. Of course, the surface of seashells are not marked off into tiny squares each of which is either one color or another (black and white in the case above), yet the patterns behave as if it were. On the other hand, if one tries to produce an elementary cellular automaton that actually produces patterns like the one shown here, the project will come to grief. The diagonal lines tell the story. A diagonal one-cell line amounts to a glider, that is, a structure that, in this context, moves either left or right. Although it is possible to have a right-moving one-celled glider - or a left-moving one - it is mathematically impossible to have both. This problem illustrates the need to ensure that the 'application' in question really does what most ecologists demand of their models, that they 'generate insight' (a phrase which the author has encountered frequently). An 'insight', to be really useful, must go beyond merely noting a resemblance. It must lead to the discovery of a new structure or process. In the case of seashell patterns, Wolfram points out that the shell pigments are laid down by the edge of the gastropod mantle, essentially one line at a time. The cells, glands, or (as Wolfram calls them) 'elements' of the mantle edge that deposit the pigments ''. . . have certain interactions with each other. And given this, the simplest hypothesis in a sense is that the new state of the element is determined from the previous states of its neighbours - just as in a one-dimensional cellular automaton.'' If an automatistic behavior is involved in such patterns, it is more complex than anything that elementary cellular automata are capable of. A review of the cellular automaton literature as it bears on ecology reveals a large range of applications, from abstract models with a somewhat fuzzy relationship to the real world to models that are focused on specific ecological problems with a view to eliciting new processes or structures in the underlying dynamic. The former end of the spectrum could almost be described as solutions looking for problems. Early in the development of the subject, it became clear that certain cellular automata bore an uncanny resemblance to real-world objects or processes. Wolfram's molluskan patterns were but the tip of the cellular iceberg. A simple three-state cellular automaton captured the dynamic of the famed Belousov-Zhabotinsky (described earlier). Other cellular automata seemed to imitate the coat patterns of bi-colored animals such as zebras and leopards. Still others gave rise to 'growths' that resembled root systems or rhizoids. The most fascinating models to watch, however, were the early predator-prey cellular automata. Abstract predators occupied some ofthe cells , while prey occupied others. Rules could be formulated not only to allow the animals to pursue or to flee, but to reproduce. In many such models, the populations of both predator and prey oscillated in the manner predicted by the Lotka-Volterra equations. These were differential equations which operated not on discrete life forms, but continuous ones, a certain amount of predator in eternal pursuit of another quantity of prey, with both populations showing smooth, regular increases and decreases. Since the Lotka-Volterra equations were already suspected by many population biologists to capture the essence of simple predator-prey relations, the cellular model promised a more meaningful theater in which specific forms of predation could be examined. As ecologists became intrigued with the possibilities of cellular automaton modeling, the subject took on a new and greatly expanded life. Of particular interest was the fact that thousands of interacting processes at the cellular (local) level could produce overall (global) changes or effects that might not have been predicted by simply examining the interaction rules. Such 'bottom-up' or 'emergent' effects include phenomena such as the complex swirling patterns of the Belousov-Zhabotisnsky reaction, the functional relationship between one variable and another, as in predator/prey models with their see-sawing populations, or long-term effects such as the disappearance of structure in Wolfram's first three classes of cellular automata. Emergent or bottom-up properties of cellular automata not only have a fascination of their own, but motivate much of the work in this area. 'What will happen if I change the density of plankton on which the prey fish subsist? Will they become extinct or will it ultimately reduce the predator population'.? It is nearly impossible to tell without adjusting the appropriate parameter and to run the model under the new conditions. Most cellular models in ecological and biological applications allow the alteration of fundamental parameters to explore emergent behavior under a great variety of conditions. 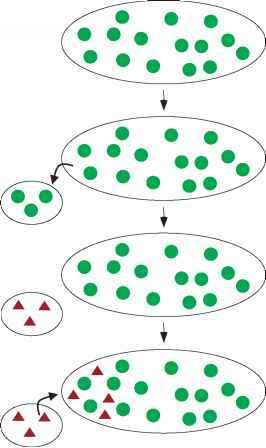 Although all cellular models share an emergent dynamism of one kind or another, the underlying spaces of the models vary in dimension. At present the great majority (90%) of applied cellular automata are two dimensional. The substrates vary from geographical areas such as grasslands to biofilms on submerged rocks, to the skin of animals, indeed any system that has a two-dimensional surface or zone connected with it. The remaining 10% involve a three-dimensional space in which animal assemblages (flocks of birds, schools of fish, myxobacterial associations, and so on), multicellular modeling (tissue growth, embryology, skeletal development), geological processes (water uptake and release, climatic effects, oil slicks), and several other areas with a paper or two each. By far the largest number of journal articles based on two-dimensional substrates involve landscapes, with approximately equal numbers focused on urban growth/ encroachment models and on vegetation dynamics in a great variety of settings. The remaining articles in this category focus on animal populations, from slugs to geese, as well as epidemiological models ranging from infections to alien plant invasions. Increasingly popular are the hybrid models, where programs replace automata, as in the example described next. The black-legged tick study examined here involves an application of the cellular automaton concept that illustrates a (1) typical focus, (2) relatively successful outcome, and (3) variation in the concept that is increasingly common. An article on simulating the spread of the black-legged tick (Ixodes scapularis) in eastern North America by N. K. Madhav et al. may be placed in the epidemiology division (sensu lato) of the ecological literature. The black-legged tick is a major vector of Lyme disease, a debilitating and ultimately fatal disease of humans. In recent decades there has been a noticeable expansion of this tick's range, offering new opportunities for human infection. Lyme disease involves a spirochete bacterium that lives in its tick hosts, then spreads to a variety of mammal and bird hosts when they are bitten by a tick. Principal vectors for the tick are the white-tailed deer, white-footed mouse, and American robin. It would be possible to predict more accurately where the tick range is most likely to expand if it were known which of these hosts played the most active role in its dispersal as a joint function of the number of such hosts and the distance they are likely to disperse the bacterium (mice: short, deer: medium, robins: long). The study used a cellular grid to represent a large area (473 km x 473 km) within the tick's eastern range, each cell in the model representing 1 km2. Each cell is inhabited by a process that is driven by both data and equations. Each process uses data from its own cell and neighboring cells to alter its own data. The process is also strictly deterministic. Notice that the 'automaton' has departed entirely, along with its states. The authors developed a number of hypotheses to test, including, (1) range expansion would be greater in areas dominated by hosts with larger ranges; (2) hosts with smaller home ranges would decrease the expansion of the tick range if they divert a sufficient proportion of ticks from hosts with larger ranges; (3) birds could expand the tick range if their densities and degree of infestation were high enough. An important parameter in the model was the tick 'burden' for each host in the model. Based on field data from the northeastern US, the authors calculated the mean number of ticks found on each of the host species over time. Other parameters included the average time that larvae (3 days), immatures (5 days), and adults (7 days) remained attached to their hosts, namely mice and birds for larvae, mice and birds for immatures, and deer for adults. Also important were the number of days spent by the tick at each stage of its life in seeking hosts. Each run of the model began with a strip of cells down one side of the grid inhabited by ticks. Not to confuse the reader, each tick of the simulation clock represented one stage in the life cycle of the tick. Thus, three iterations would amount to one life cycle. The model was run for the equivalent of an 18-year period for each combination of parameter values under test. At each iteration, this cellular model used host densities and their tick burdens in each cell, along with its four neighbors, to calculate the maximum number of ticks that can be supported in the neighborhood. This figure, in turn, yielded an estimate of the actual number of ticks feeding on a host species. The resulting engorged ticks were then distributed within the neighborhood to experience a degree of mortality, the survivors forming the basis of the next iteration. The experiments produced some interesting results. First, the sensitivity analysis (a key component of all model building) revealed that the cellular model was highly sensitive to tick mortality. In other words, relatively small changes in the mortality parameter could produce large changes in how rapidly tick range expanded. The model was also sensitive to the home range of both mouse and deer hosts, as well as nymphal burdens. The results of the sensitivity analysis revealed the great importance of accurate estimates of certain field data, including on-host tick mortality, yearly tick burdens of host species, host behavior, and home range dynamics. In addition, accurate estimates of range expansion in the field (under appropriate conditions) would be necessary to validate the model. The main experiment involved many runs of the model, in which each of the parameters was varied over three orders of magnitude. In this manner 125 host density combinations were tested. According to the model runs, deer density was significantly correlated with expansion of tick range, whereas with deer densities held constant at certain values, mouse densities were negatively correlated with tick range expansion. The authors sound a cautionary note that more work is needed, not only to further validate the model, but to make the cellular landscape more realistic by including geographical barriers, such as rivers. Given that cell-to-cell interactions are represented by relatively realistic functions, the behavior of the model, though still requiring further validation, is correspondingly more realistic. Such a large proportion of work in this area involves nonautomaton modes of operation that the term cellular model would better categorize the research. See also: Classification and Regression Trees; Ecological Complexity.